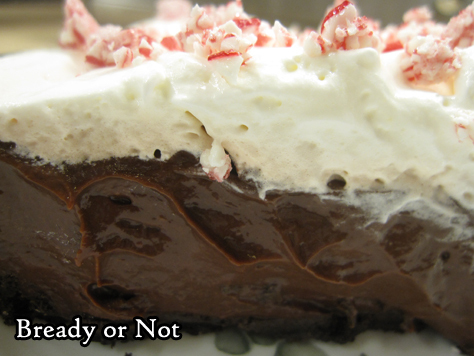 If you want a treat that is decadent, gorgeous, and loaded with peppermint, bake this up. But once you put the peppermint bits on, eat them within a few hours. 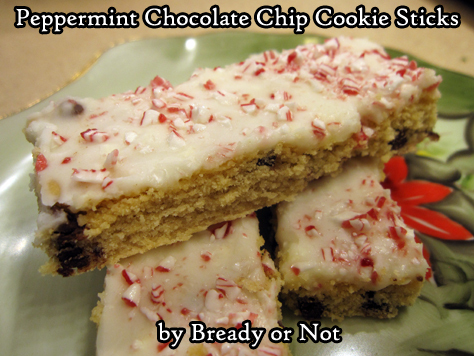 That’s right, this recipe has the same issue as the Peppermint Chocolate Chip Cookie Sticks a few weeks ago. See that picture above? That’s what the peppermint does, melting to look like stained glass. 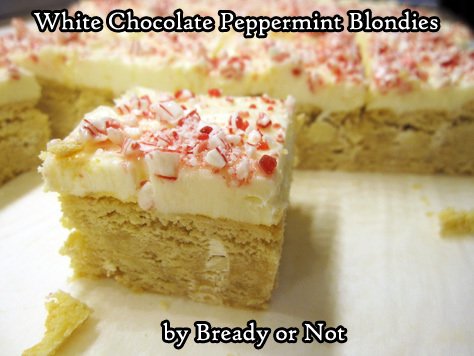 It’s a purely cosmetic issue; the bars still taste fine and the peppermint even retains a slight crunch. The solution to this is pretty easy, though. 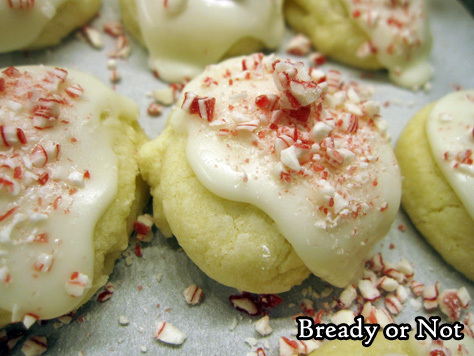 Add the peppermint bits right before serving, or just omit them. 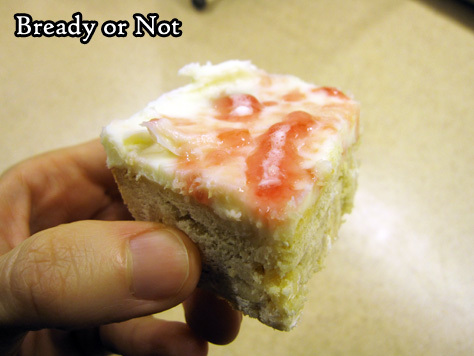 Or be prepared to eat them with oozy peppermint on top, as they’ll still taste fine! With that disclaimer done, I can say these things taste absolutely delicious. 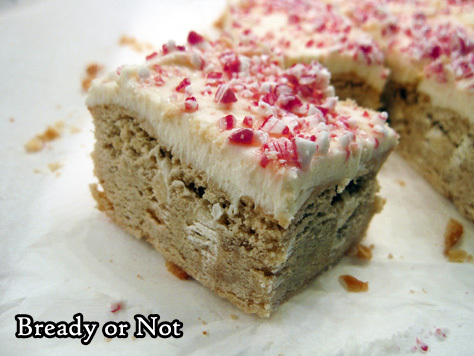 I mean, hello, blondies topped with cream cheese frosting! These are practically a cake. Modified from County Living, December 2015. 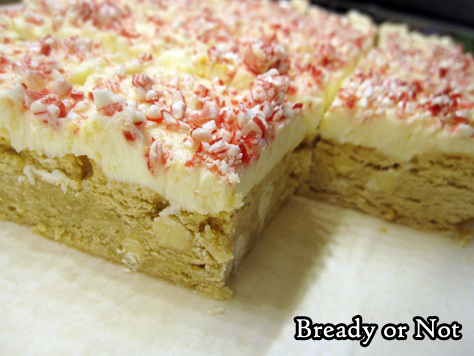 These blondies deliver sheer holiday decadence! Peppermint, white chocolate, and cream cheese frosting work together in a glorious way. 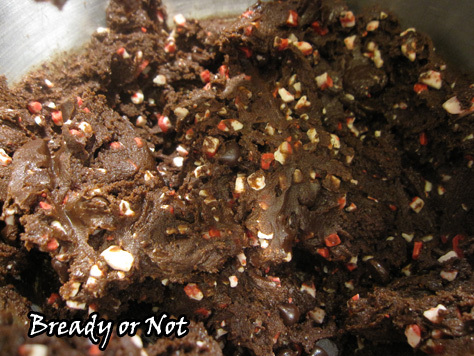 Do note that the crushed peppermint bits will melt after a few hours, regardless of the temperature at which the bars are kept. They’ll still taste fine, but they don’t look as pretty! Preheat oven to 325-degrees. Apply nonstick spray or butter to an aluminum foil-lined 9x13 baking pan. Beat together butter, both sugars, eggs, 1 teaspoon vanilla, and peppermint extract. In a separate bowl, whisk together the flour, baking powder, and salt. Stir the dry mix into the butter mix. Add the chocolate chips. Spread the batter evenly in the prepared pan. Bake until golden brown and the middle passes the toothpick test, about 30 to 35 minutes. Cool in pan on rack until room temperature, or place in fridge to chill. When the blondie base is no longer hot, beat together the cream cheese and confectioners' sugar until they are light and fluffy, about 1 to 2 minutes. Beat in the remaining 1 teaspoon vanilla. 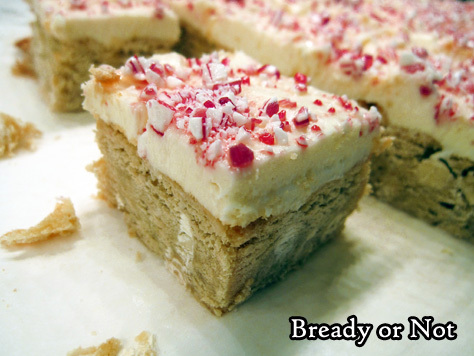 Spread frosting over blondies. Freeze for 30 minutes or chill in fridge for several hours to set. Add crushed peppermints just before serving. 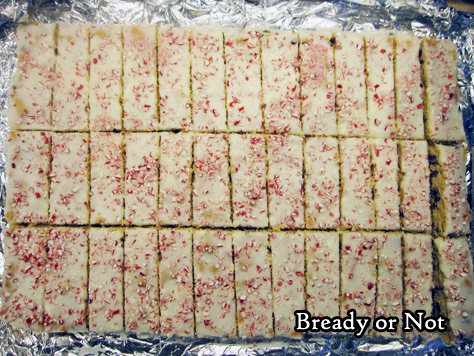 NOTE: after a few hours, the peppermints will melt, regardless of the temperature of the bars. It looks weird, but tastes the same, even retaining a slight crunch. Other than that, the bars keep fine in the fridge for at least 5 days. 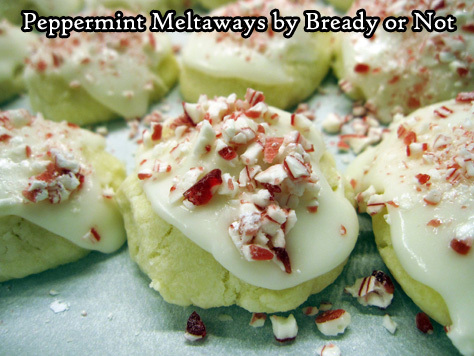 Do you love those peppermint meltaway candies that dissolve in your mouth with such refreshing flavor? Imagine that, in cookie form. Yes. Really. This recipe essentially makes very lightly-textured shortbread cookies. 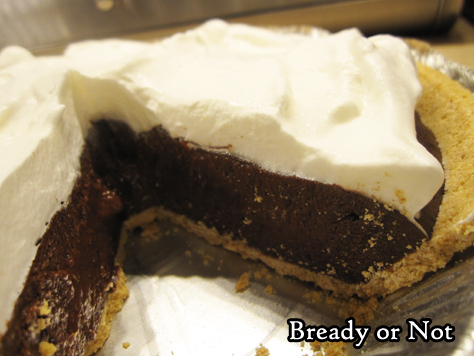 That texture arises from the use of confectioners’ sugar and cornstarch. These are like cookie clouds. 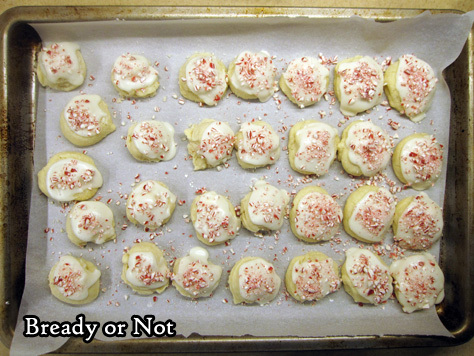 Then you top those small cookies with a smear of frosting and some crushed peppermint bits. The combo… yeah. These are called meltaways, and that’s exactly what they do. Plus, these things literally LOOK like the holiday season. Like snow and peppermints. If you’re searching for a recipe to wow everyone in a cookie exchange, these are your cookies, and they don’t even taste or act like cookies. They’ll blow your mind. Blow the minds of everyone there. Modified from Taste of Home, November 2015. 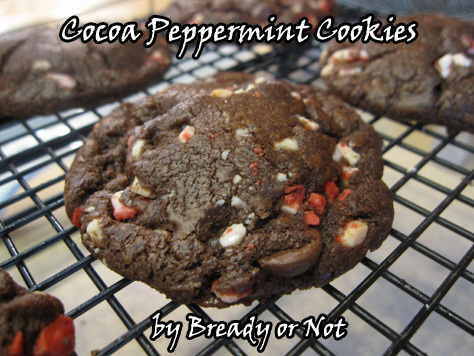 These cookies taste and act like peppermint meltaway candies! 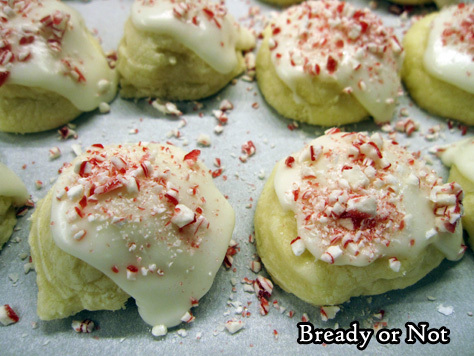 The cookies are like light little clouds, and are the perfect conveyance for the refreshing frosting with peppermint bits. In a mixing bowl, cream together the butter and confectioners' sugar until light and fluffy, then add peppermint extract. Gradually beat in the flour and cornstarch. Wrap dough in plastic wrap and chill for 30 minutes or so, until the dough is firm enough to work with. Preheat oven at 350-degrees. Using a teaspoon scoop, dole out dough onto a cookie sheet. Use a spatula or the bottom of a glass to lightly compress the cookies, as they may not spread much while baking. Bake for 9 to 11 minutes, until set. Let cool on sheet for 10 minutes, then move to a rack to finish cooling. When the cookies are room temperature, prepare the frosting. Mash the two tablespoons butter until creamy; add the milk and peppermint extract. Beat in the confectioners' sugar until it is smooth. Add more sugar or milk, if necessary, to reach a thick yet spreadable consistency. 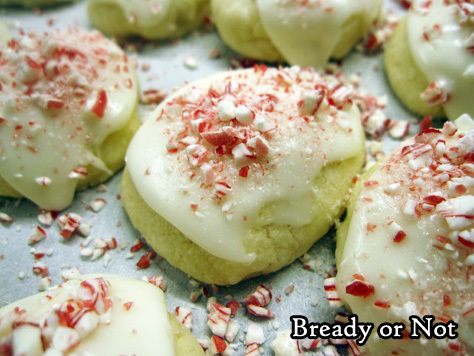 Use the back of a spoon to frost the cookies then sprinkle with peppermint candies. Store in an airtight container with waxed paper or parchment between layers. Makes about 25 teaspoon-sized cookies. 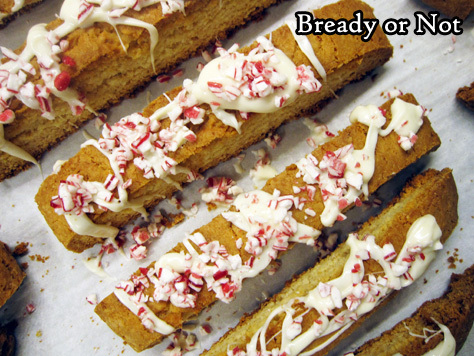 Imagine chocolate chip-flecked shortbread sticks adorned with a thin sheen of frosting with dazzling gems of peppermint. If you love peppermint and chocolate, these cookie sticks will bring you bliss. But do heed a rather important warning. 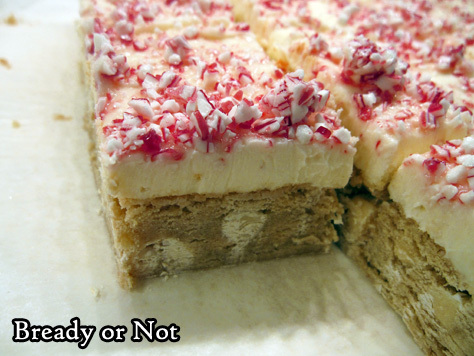 If the peppermint bits sit in the frosting for more than a day or so, they’ll actually melt. Seriously. It’s some kind of chemical reaction. Puddles of red goop everywhere. But here’s the thing: the sticks still taste fine if that happens! They just look like they stared at the Arc of the Covenant. 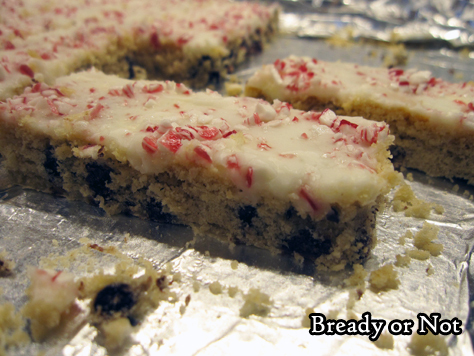 So make a big ol’ jelly roll pan of these, and hold off on adding the peppermints adornments until soon before serving. Or put them on, and use it as a kind of science experiment. A very delicious experiment. Did I mention these were like shortbread sticks loaded with chocolate chips and slathered with frosting? Oh yeah. These are good. 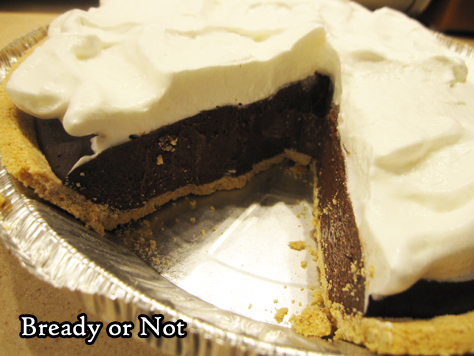 Modified from Crazy for Crust at Challenge Dairy. These handy cookie sticks are loaded with holiday deliciousness with a perfect combination of chocolate chip shortbread, thin frosting, and crushed peppermints. Do note that the peppermint chunks will dissolve into the frosting if they sit there over a day or so, so add them just before serving. Preheat oven to 350-degrees. Line a jelly roll pan (10x15-inches) with foil and apply nonstick cooking spray all over the surface. Cream together the butter and sugar until fluffy. Mix in egg and both extracts, followed by the baking soda, cream of tartar, and salt. Add flour until just incorporated, then the chocolate chips. Use your hands to press the dough evenly into the prepared pan. Bake for 15-18 minutes, until it's just starting to turn golden brown at the edges. Cool completely before frosting. For the frosting, cream butter until smooth. Slowly mix in powdered sugar until it starts to become crumbly, then add the salt and vanilla extract. Stir in 2 tablespoons of milk, then add more until it is spreadable consistency. 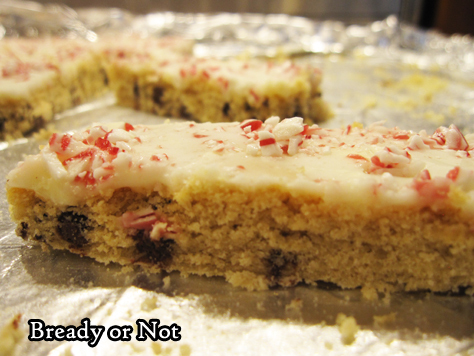 Use the foil to lift the cookie slab onto a cutting board. Use an uneven spatula to frost the full surface. Let the frosting set for a short while. Slice cookies into sticks. 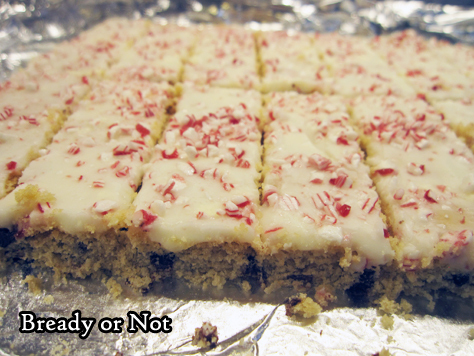 DO NOT sprinkle crushed peppermints on until soon before serving--the candies will actually dissolve into the frosting after a day or so, which looks bad though they still taste fine. 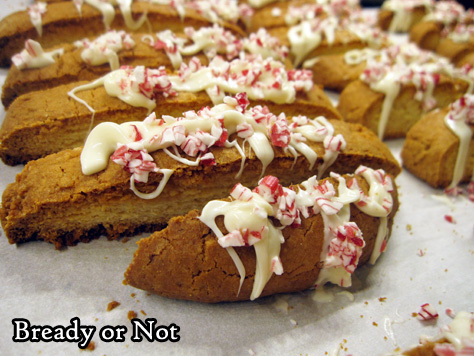 In recent months, I have shared recipes for Snickerdoodle Biscotti and Maple Walnut White Chocolate Biscotti. 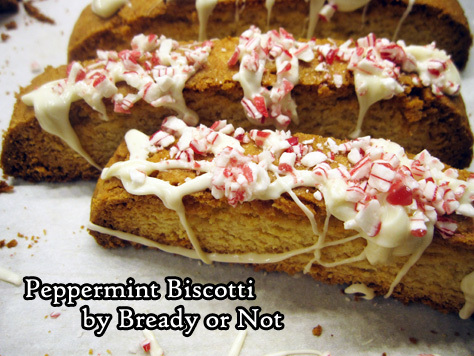 Now we’re gearing up for the holidays with Peppermint Biscotti. I found this recipe in a Food Network Magazine from December 2015. I made it following their instructions, wasn’t pleased with the results, and made it again with numerous changes. This one worked. I love how white chocolate chips work in biscotti. Since they bake up to be extra crispy, the chips add just the right touch of sweetness to complement the crunchiness. 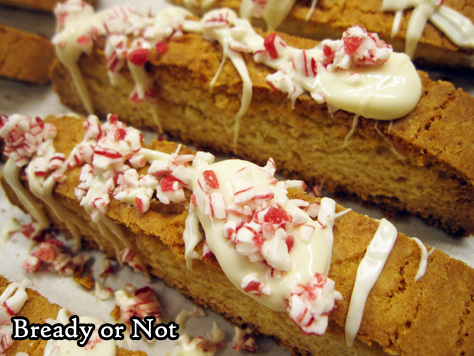 The topping is what makes these scream “Holiday season!” I love the goopy drizzles atop these sticks, with generous amounts of crushed peppermints on top. As these are biscotti, they keep well for days and weeks. If you’re mailing these, of course, be wary of the temperatures the package may encounter in transit. That’s something I always must consider here in Arizona! Eat these biscotti on their own, or totally bliss-out and dip them in coffee or tea. 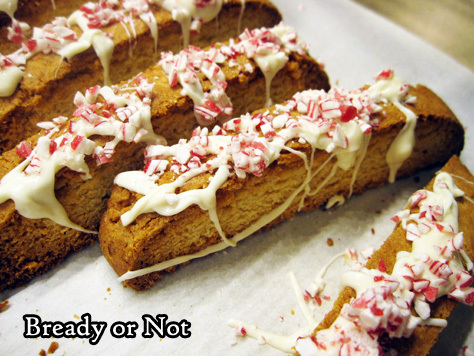 These Peppermint Biscotti are infused with peppermint flavor from the flecked drizzle on through the cookies themselves. They look and taste like the holiday season! Preheat oven to 350-degrees. Line a baking sheet with parchment paper; set aside. In medium bowl, measure out the flour, baking powder, and salt; set aside. In a big bowl, beat together the butter and sugar until light and fluffy. Add the eggs and peppermint extract. Slowly stir in the dry mix until just incorporated, then add the white chocolate chips. Bake about 25 minutes, until the biscotti is lightly browned. Remove the baking sheet, but be sure to leave the oven on. Arrange the biscotti spaced out on the baking sheet. Stand them up if possible, or lay them on their sides. Bake for another 25 minutes, flipping them over halfway if necessary, to equally crisp both sides. Cool completely on the baking sheet. Crush the candy canes. Melt the white chocolate on the stovetop or in the microwave; if necessary, stir in a drizzle of coconut oil or vegetable oil to make the chocolate loose enough to dribble. 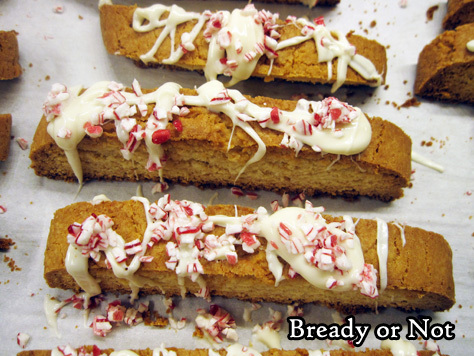 Drizzle the chocolate all over the biscotti, then immediately sprinkle peppermint chunks over them. Let them set for a few hours at room temperature or in the fridge. Store in an airtight container as long as a few weeks. I bake a wide variety of things and send the goodies along with my husband to his work. When the guys there say, “These cookies are among the best ever,” that makes me take notice. 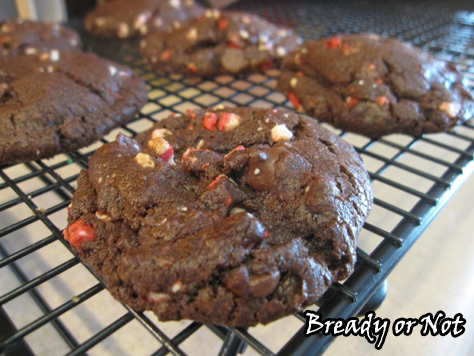 I first found this recipe on a bag of Andes Baking Chips, dubbed with the long name of “Andes Double Chocolate Peppermint Crunch Cookies.” Whew. 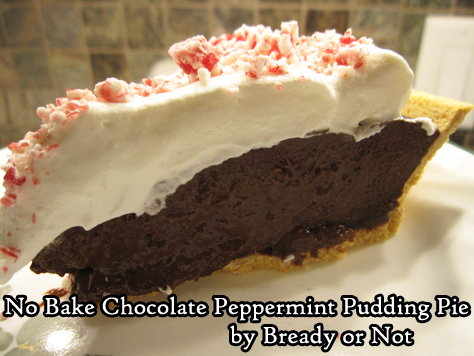 I modified it by taking out the nuts (they just don’t pair well with peppermint, I think) and compensating by adding more mint chocolate chips. Because you can’t go wrong with that. I chilled the dough, since that often produces better cookies, and I was surprised at how much this dough still spread. Be sure you space out those dough balls! These cookies would be fantastic for a holiday cookie exchange or to give as a gift. The Andes chips look fantastically festive against the backdrop of rich dough… and you know what? They taste darn good, too. 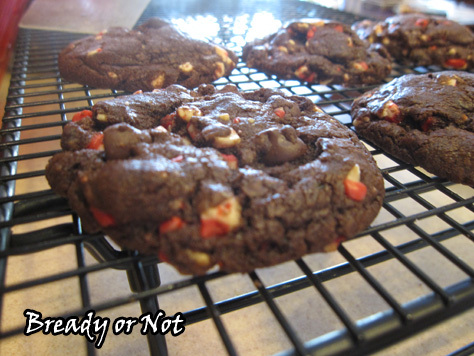 Modified from a recipe found on Andes Peppermint Crunch Chips package; also found online. In a small saucepan on low heat, melt the butter with the espresso powder, stirring often. When the two are incorporated, remove the pan from heat and set aside to cool for an hour. 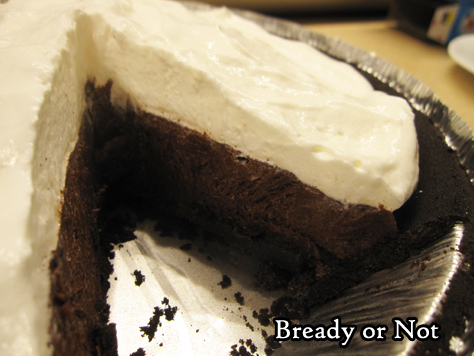 In a medium bowl, sift together the main dry ingredients: flour, cocoa, baking soda and salt. Now it's time for the big mixing bowl. Pour in the cooled butter mixture, then add the white sugar, brown sugar and vanilla extract. Beat at medium speed for a few minutes until it's all creamy. Beat in the eggs, one at a time. Gradually work in the flour mixture a bit at a time until it's just blended. Now stir in the Andes Chips and the extra chocolate. Wrap the dough in plastic wrap and stash it in the fridge to chill for a few hours or days, or even freeze it. When it's time to bake, preheat oven to 350-degrees. Drop the dough in rounded tablespoons about two inches apart on a greased or parchment-lined baking sheet; note that this dough does spread, even when the dough is chilled. Bake for 10 to 12 minutes. Let them rest of the cookie sheet a few more minutes to set, the transfer to a wire rack to finish cooling.